Seamounts are the mountains of the deep. A seamount is typically an extinct submerged volcano that has risen from the seafloor. If enough volcanic material erupts, and the material is amassed atop itself, a seamount can rise above sea level to become a high island like the Hawaiian Islands. Many volcanoes go dormant or become extinct to remain seamounts below sea level. Seafloor mapping missions are still discovering new seamounts. Gravity fields recorded by the NASA Jason-1 satellite, combined with gravity measurements from the ESA CryoSat-2 satellite, have enabled scientists to map thousands of previously uncharted seamounts. Last August, while delineating the extent of the U.S. continental shelf in the Pacific Ocean using a multi-beam echosounder, scientists discovered a 3,600 ft seamount 186 miles southeast of Jarvis Island in the South Pacific. 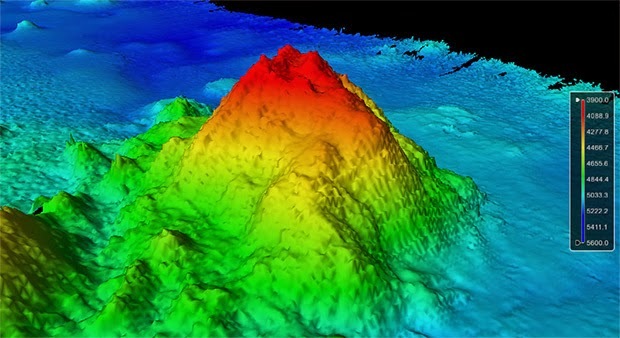 New map uncovers thousands of unseen seamounts on ocean floor, NSF, 4 Oct 2014. New Seamount Discovered During ECS Mapping, NOAA, 20 August 2014. Scientists discover seamount in Pacific ocean, Phys.org, 4 September 2014.